Key Knife has revolutionized chipping by developing a system that delivers unmatched durability, ease of use, performance, and flexibility. The KPS System is designed for the progressive mill that is looking for new cutting edge technology to greatly improve chip quality and operating efficiencies. Whether you chip softwood, hardwood, frozen wood, or dry wood the KPS’s flexibility gives you increased control over your operation and chip distribution. •Uni-Ridge Knife consistently formulates a uniform chip and provides a smooth transition from the knife across the counterknife. The smooth transition greatly reduces the break up of quality chips into pins and fines. ​•System is adjustable so optimal settings can be achieved for the best chip quality. 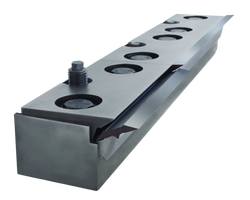 •Long lasting knife edge reduces frequency of knife changes, adding valuable uptime. •Quick knife change features shortens knife change time. •Uni-Ridge knife can be rehoned for additional savings. 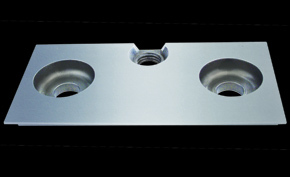 •Segmented pocket design allows for worn or damaged parts to be rotated or changed quickly. •Smaller Uni-Ridge Knife is safer to handle. •No knife grinding or babbitting. Allows user to quickly change knives by simply loosening a few load screws. Clamp bolts stay torqued as the counterknife pivots down to release the knife. The clamp is precision ground and CNC machined from forged 4340 steel. A locating feature clamps down on the top key of the Uni-Ridge Knife for added stability, eliminating knife movement during operation. 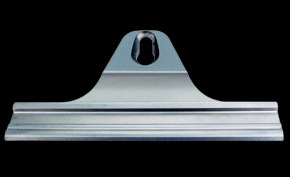 The holder is CNC machined from 4340 steel. A diamond carbide powder is weld-fused to the contact surface ensuring the longevity of the holder in even the most aggressive applications. 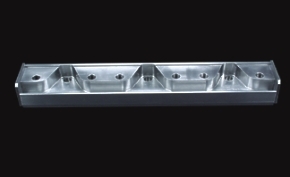 An end plate is welded to each end of the holder to block contaminants from entering the system. The unique segmented pocket design allows rotation of wear parts in and out of the cutting zone for maximum life. The counterknife is CNC machined from forged 4340 steel and precision ground to mate perfectly with the Uni-Ridge Knife. 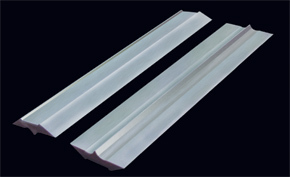 Diamond carbide is weld-fused to the contact area for additional wear resistance. 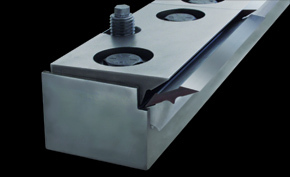 The KPS’s clamping system produces 4 point knife clamping. 4 point knife clamping significantly improves knife stability, for a precise and repeatable cut, and longer knife life. The knife is manufactured from modified tool steel for exceptional knife life. An optimal tip to breaker distance enhances chip formation, resulting in improved chip quality. 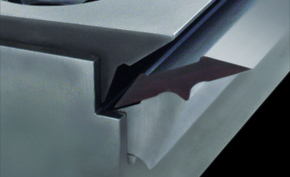 An oversized single ridge located on the bottom of the knife improves chip flow, and protects the counterknife from wear. The knife is indexable and rehonable, eliminating the need for grinding and babbitting.